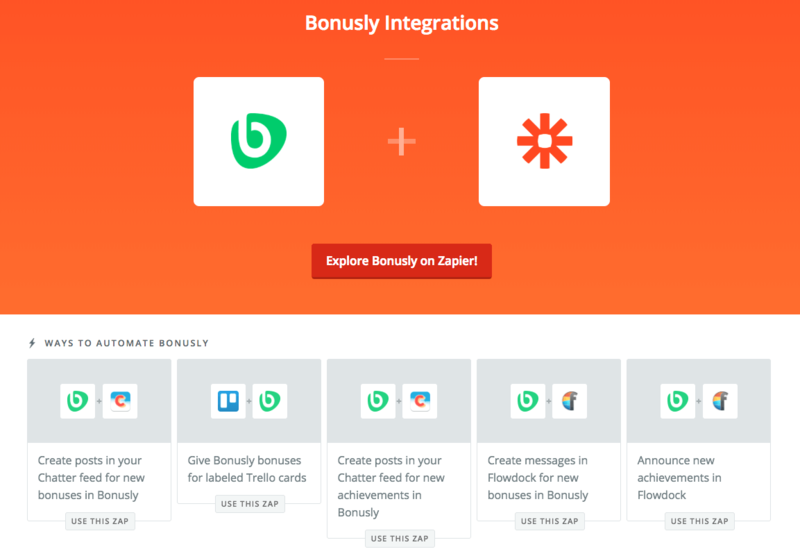 The Bonusly integration with Zapier enables users to connect Bonusly to 1,000+ other web services. By setting up “Zaps”, you can automate your workflows and day-to-day tasks to recognize co-workers instantaneously for their hard work. 🎉 In this article you'll learn what great Bonusly + Zapier options are available, and how to set up our integration quickly, and easily! “Zaps” are integrations with other Zapier partners. They perform an action in one app when a trigger event occurs in another. Any time a new bonus or a new achievement happens in Bonusly, you can trigger an action to take place in another integration. For example: If you use the "New Bonus" trigger with the action "New Post in Feed" by Chatter (a Salesforce collaboration platform), you could make an announcement in Chatter whenever a new bonus is earned. Any time a trigger takes place in an integration that you would like to reward, you can set up an action in Bonusly to give a bonus. For example: If you use the "New Event Matching Search" trigger by Google Calendar with Bonusly's "Give Bonus" action, you could give a bonus each time a specific type of event is created, such as a sales call. 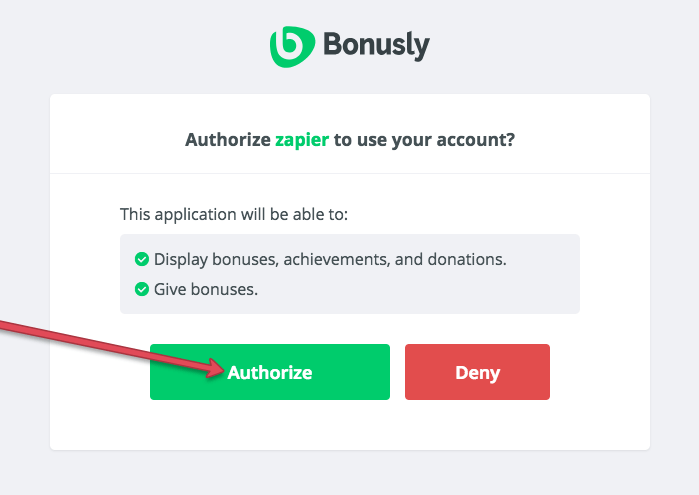 Now that you know what great Zaps can be made with Zapier + Bonusly, let's set up your integration! Here is a quick step-by-step guide, so you can start Zapping! 3. Zapier and Bonusly are now connected! 🎉 You're ready to set up some Zaps! Ready to make some Zaps? Head over to Zapier to learn how to add pre-built zaps to your account and create Zaps from scratch! 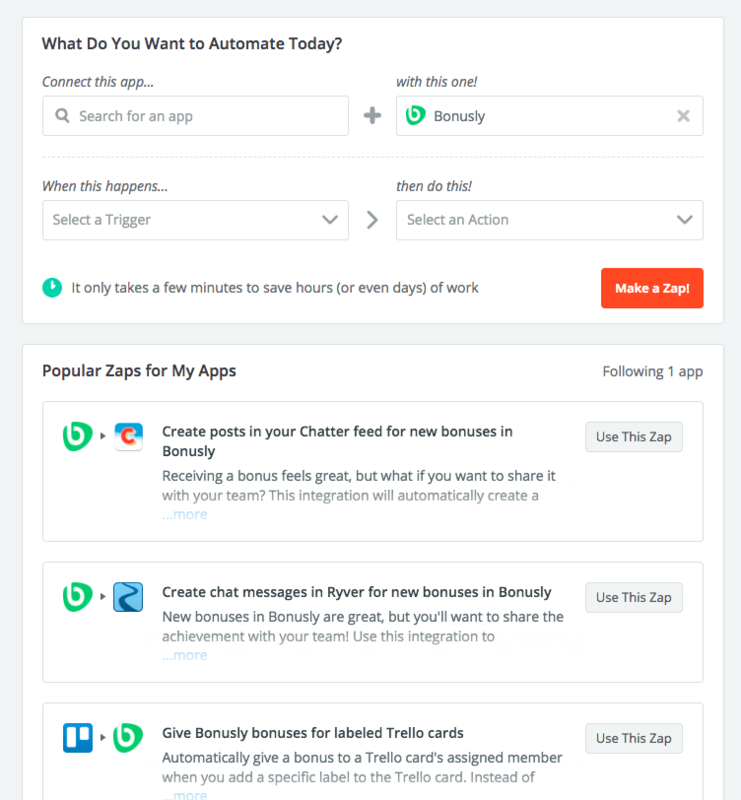 Need help setting up your Zapier integration? Shoot us a message at support@bonus.ly and we'll get you squared away!